And just like that, the top is done! I really love it – it turned out great! The initial project plan was to do the reverse of Vanessa Christenson’s Hopscotch, like she did here. I posted about adding extra rows to this quilt to make it large enough to be used for a few years and to use up as much of the fabric as I could. I don’t need leftovers sitting in my stash until who knows when! Also like Vanessa’s, I’m strongly considering quilting this myself with straight lines. I REALLY love how hers turned out so I think I’ll give it a go. It appears that I REALLY liked her Hopscotch pattern. I purchased the pdf download version from her site last week and when I tried to move the file to a different location on my laptop, I got the message that said, ‘hey lady…you already have a file with that same name…want to replace?’ So, yeah…I bought it twice! Whoops! I have no idea when the first time I bought it was. 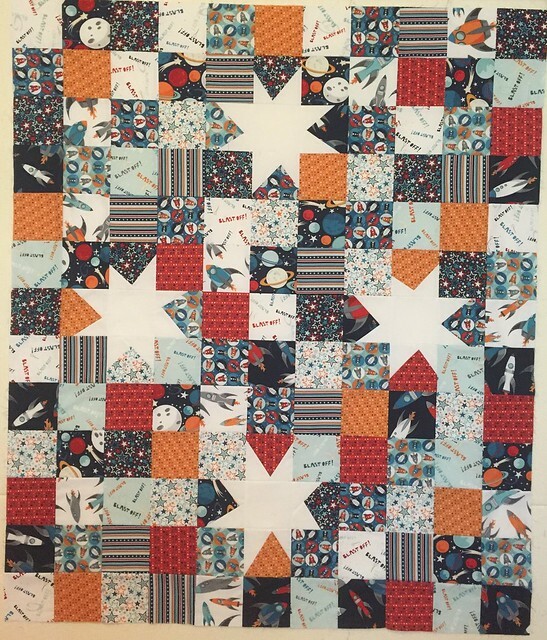 This entry was posted in Quilts and tagged Blast Off, Hopscotch quilt pattern, V and Co, Vanessa Christienson. Bookmark the permalink. 8 Responses to Wonky Stars – Top Done! it looks great! What a fab boy quilt it’s going to be. 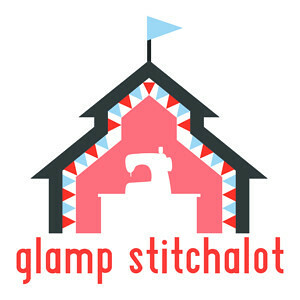 And yes, you definitely should quilt it yourself! Chuckle! Been there done that, not with e-files,but with books, with fabrics. Double love. I’ve done it with backing fabric, too! This is fabulous! I love the idea of a few white wonky stars adorning a patchwork of novelty prints. This may prove to be inspiration for my younger son’s bed quilt! So beautiful! Even a simple quilting will make it the most wanted quilt for a boy! It’s really wonderful and love the way the stars go with the outer space novelty prints! Thanks, ladies! I really love this! That is a pretty awesome quilt! What a great gift! It has been fun seeing it take shape.